Ahh, the joys of planning a wedding. Or should we say, the stress? When you think about the flower arrangements, the last-minute invites and cancellations, the catering, and more, it’s easy to get overwhelmed. But, as your wedding gets closer, you’re sure to feel all the love in the air, too. Everything builds up to the ceremony, then flows into your honeymoon. That’s right, once all is said and done, not only are you officially hitched but you get the chance to celebrate your wedding with your special someone! If you haven’t thought about the honeymoon yet, take a break from wedding planning and focus on these details. Do you want a tropical destination, a tour of many countries, or a staycation? A tropical honeymoon destination is hands-down the way to go, and there’s no better place than Costa Rica! Here are 10 reasons why you should have your honeymoon in Costa Rica. Maybe you think you have to lower your honeymoon budget to pay for the wedding itself. This may be the case, but that doesn’t mean you have to sacrifice the actual quality of your honeymoon, especially if you choose to go to Costa Rica. Flights to this beautiful country are more affordable than most people would guess, and the exchange rate is in your favor, too. It’s much more accessible to find a good flight and hotel and set a budget here than, say, to have a European honeymoon or even go elsewhere in the tropics. To get the most out of your money, though, check out vacation packages in Costa Rica. Another reason to have a Costa Rica honeymoon is the weather. No matter if you’re getting married in mid-July or late December, you’re sure to arrive at a friendly climate. Costa Rica is warm and sunny all year round. There may be a few days of rain here and there, but not to the extent that your vacation is affected. Just don’t forget to bring your sunscreen! This is arguably what Costa Rica is most known for. The beaches are truly some of the best in the world. They’re popular destinations for top-level surfers and curious tourists alike. You and your partner can learn to surf together or simply sit by the shore and watch the waves roll in. To make the most of your time here, though, at least go snorkeling or kayaking to really discover what the waters of Costa Rica have to offer. There are the breathtaking Costa Rican beaches, and then there are the country’s amazing waterfalls waiting for you within the rainforest. This is something you can’t leave without experiencing for yourself. Set aside a day to go on an excursion into the jungle. You can go zip lining through the treetops or hike on the ground, but be sure to stop for a dip in one of the waterfall pools. It’s an experience unlike any other, something you and your new spouse are sure to always cherish. What if you and yours are the classic case of opposites attract? Don’t worry, there’s something for everyone here. The adventurous one of the two of you can take their pick of everything from ATV excursions to white water rafting to visiting volcanoes. Since the point of a honeymoon is to enjoy time together, though, try to find a balance between adventuring and relaxing. Speaking of relaxing, this doesn’t just mean have a drink by the pool or watch movies in the hotel room together. It means book a couple’s massage in the hotel spa overlooking the beautiful sights of Costa Rica. It means to plan a trip into town and spend the day indulging your curiosity among the shops and smells of different restaurants. It means to learn about the history of Costa Rica or just spend a day making up the plans as you go. Remember, you’re on vacation – there’s no to-do list other than to enjoy each other’s company and take it all in. It’s one thing to visit a major city and get caught up in the hustle and bustle. Once you touch down in Costa Rica, though, Mother Nature makes you move to a different tune. There’s no rush to do anything here, no agenda to take care of. You can easily spend an entire morning walking the beach or an afternoon listening to the birds and other wild animals. 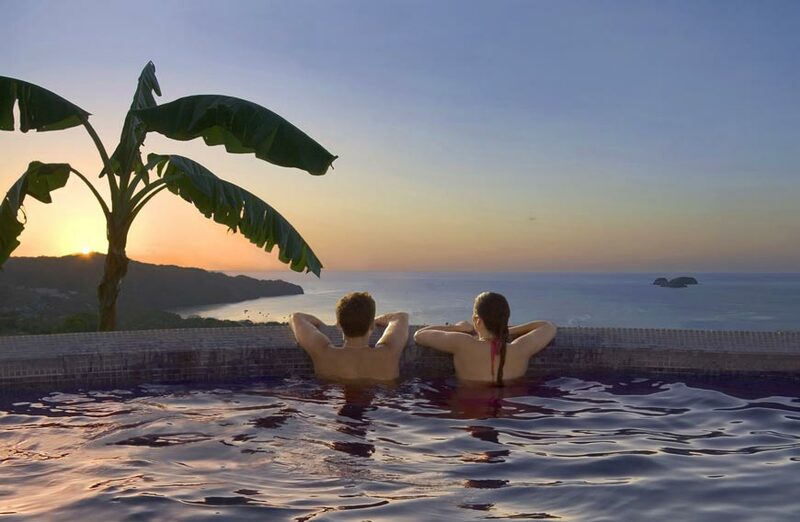 You can lay in bed for hours watching the jungle come to life and no matter how long you stay, you won’t get sick of watching a Costa Rican sunset. That’s just how it is here. Paradise, readily available everywhere you look. Sometimes, people worry about a tropical honeymoon destination because of diet restrictions. Are you vegetarian or vegan? Does your fiance have a gluten intolerance? No worries – when you come to Costa Rica, you can make plenty of dietary adjustments in advance. Be sure to tell your hotel or tour group of your special diet needs. When venturing into restaurants or cafes, rest assured you can usually find fresh produce and other easy substitutions. Whether you stay in one of Costa Rica’s major cities or head straight to the beach, this vacation is all about you and yours. The beauty of being in such a lively, diverse place is you get to call the shots as your travel bug leads the way. At the end of the day, no matter what you do in Costa Rica, you’re going to learn one thing for sure: the meaning of Pura Vida. Literally translated, this means pure life. But, in Costa Rica, the phrase really comes alive. You’ll feel it in the way people greet you and take care of your needs. You’ll see it in how locals interact with one another and how they carry themselves, too. Simply put, there’s an infectious, genuine sense of happiness in the air. What two lovebirds on their honeymoon wouldn’t enjoy that?! Stop stressing over your wedding and start getting excited about the celebration that’s to come. This is your special day, and when it happens, you’re not going to be worried about the table sets or the music as much as you think you will. The point is to enjoy this time, then celebrate your marriage in a more intimate manner by getting away. A tropical honeymoon destination is a perfect place to go. Click here to start booking your Costa Rican experience for two.